Congregations in decline, churches closing or amalgamating with old rivals – modern concepts? No, this has been happening in York for centuries. As it has grown and developed so the places of religious worship have changed, reflecting the demographics or religious fashions of the period. 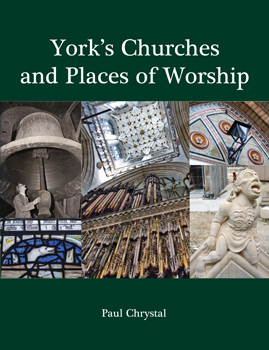 This book is an in-depth study of York's churches (in the broadest sense), places of worship and other buildings with religious connections. The scope is wide, from Roman temples to the present day with all religions and their associated schisms represented, including detail of architectural features recycled in other locations. In summary the book is a comprehensive work of reference.